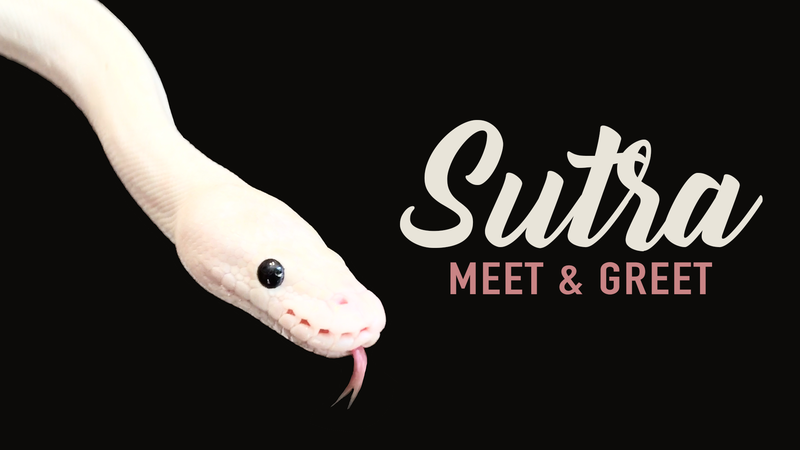 Each month, we devote two hours to a meet and greet session with Sutra, open to all ages. Our customers can take turns holding him, ask questions, and get pictures. These meet and greets take place at 80 N. Lexington Ave. Ste. B in Asheville, NC. This is a free event! Our store would not be the same without our familiar, Sutra the leucistic ball python. He is three years old, which is kind of like being nine in people-years. He is one of the most loving and curious creatures we have ever happened upon. He loves hanging around with our shop keepers and meeting new friends, especially kids! Sutra came into our lives in June 2018, after receiving many messages from Spirit that we were in great need of snake medicine. Here at Earth Magick, we believe snake medicine is all about transformation and transmutation – shedding what no longer serves us and embodying our Truest Self – letting go of something to become something greater. Befriending Sutra has been such a joy for everyone here at Earth Magick, team members and customers alike. Unless there is a risk of inclement weather or power outage, he is always in the shop, but is not always out of his habitat. After all, he needs his beauty rest! Check out the schedule at the bottom of this page to find out when our next Meet & Greet will be. If you have any photos with Sutra or experiences to share, use #SutraTheBallPython on Instagram! Ball pythons, or royal pythons, can live to be between 20 to 30 years old. They are native to the Sub-Saharan part of Africa (but Sutra is from Charleston, SC). Most ball pythons are pretty shy, but Sutra loves to be out and about with his Earth Magick family. Sutra is one of the most affectionate creatures we know! He actually asks us for forehead kisses and loves to cuddle. Sutra does have teeth, but they are tiny! Only a few millimeters long and thinner than a hand-sewing needle. He can bite, of course, but he is no more likely to bite you than the average puppy you would rush to pet on the street. Sutra eats frozen and thawed rats, every other week. We do not feed him live rodents. About once a month, Sutra sheds his skin, which is a potent time here at the shop. Each time, it feels like we are digging deeper into what it means to transform, to let go, and to evolve both physically and spiritually. Each time, our curator sits in deep meditation and crafts what we call Transformation Magick Jars, combining Sutra's shed skin, gemstones and other natural items to channel the energy of this unique and soulful medicine.